DungeonQuest is a relatively old game, with the first edition being released in Sweden as Drakborgen (“Dragon Fortress”) in 1981 with Games Workshop (of Warhammer fame) releasing the first English edition in 1987. The goal is simple. Players take on the role of various adventurers entering into Dragonfire Dungeon in search of treasure, exploring it’s cavernous layout and battling ferocious beasts, hoping to escape before the doors shut at sundown. 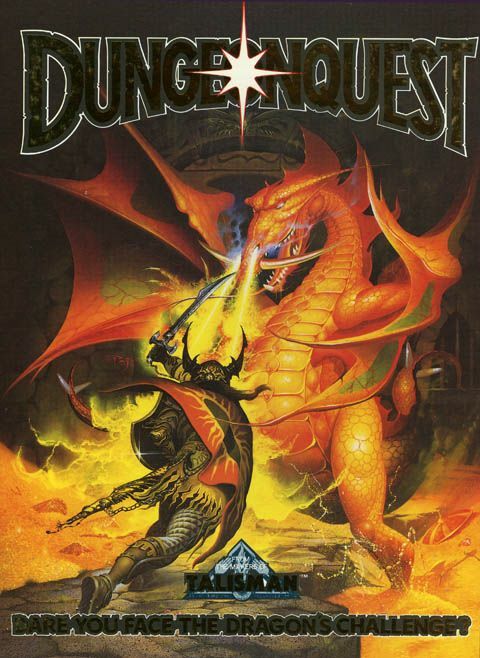 On the surface, this premise seems fairly standard for the dungeon crawling genre, but what separated DungeonQuest from the pack were the lack of a Dungeon Master, randomly generating levels, short playtime and brutal difficulty. In the end, DungeonQuest was fairly successful, garnering a decent following which led to multiple expansions and a reprint by Fantasy Flight Games in 2010 (the version I’m reviewing) and a revised edition in 2014. To begin, DungeonQuest is not a story heavy game. 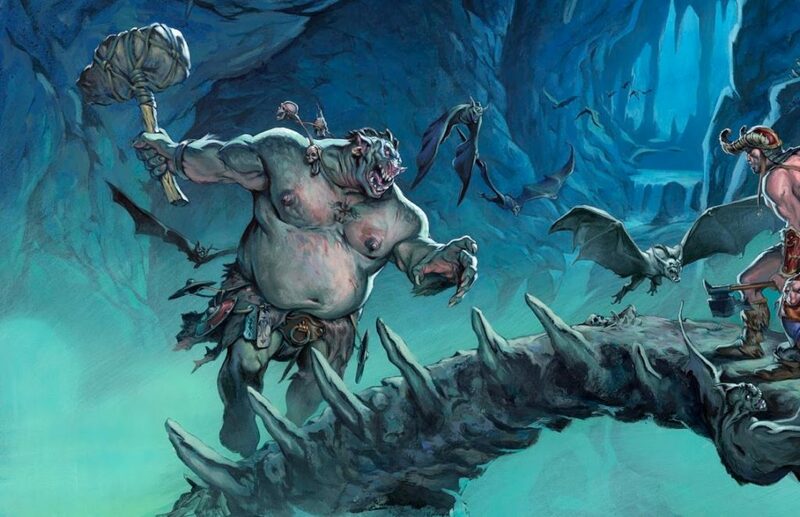 To put it simply, a dragon, named Kalladrah in the Fantasy Flight Edition, has created a fortress in which to house his vast treasures in order to lure greedy adventurers into his lair. Many have entered into the Dungeon’s vast halls, but only the bravest, strongest, smartest and, in most cases, luckiest have escaped with their lives. The rest have perished, leaving whatever resources they brought with them for the dragon’s treasure chambers. Those adventurers who do perish do so in a verity of ways. Dragonfire Dungeon is full of deadly traps and monsters which do Kalladra’s bidding. Even, worse, the Dungeon is designed like maze designed to confuse and trap those who are unprepared. On top of it all, the spell which holds the doors open during the day will lock them which the sun sets, leaving any unfortunate adventures who were too slow to escape trapped and awaiting Kalladra’s wrath. At a first glance, DungeonQuest may seem complex. However, once players gain a firm understanding of it’s basic mechanics, they will realize that it’s actually quite simple as far as dungeon crawlers go. Players begin by selecting one of six adventurers, each with unique strengths, weaknesses and special abilities. DungeonQuest begins with all players on one of the four corner spaces or towers. As the game progresses, players are going to take turns moving one space at a time. If they should ever want to enter into an unexplored area of the dungeon, players will randomly draw a dungeon tile, which shows a unique room with doors, corridors and walls. 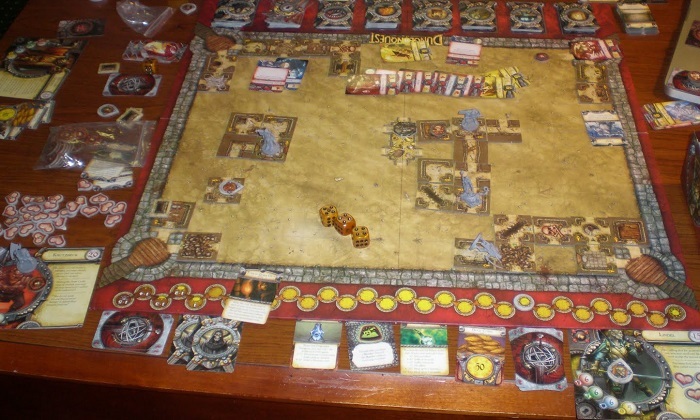 Progressing this way, the dungeon will form randomly each game as players make their way to the central treasure chamber at the center of the board. That is very basically how DungeonQuest functions. drawing cards and tiles from the right decks for each situation. Ocasionally, this manner of play is broken up with a skill test or a battle against one of the monsters which roam the dungeon halls. However, for the most part, the game revolves around a drawing and resolution concept. On the one hand, this makes each game completely unique and keeps it fresh from playthrough to playthrough. On the other, it can make the game feel like it’s on autopilot a lot of the time. How are the Components in DungeonQuest? A big part of any board game is the quality of the components. Fantasy Flight games has generally put out some great components and artwork with their games, and DungeonQuest is no different. For reference, here is a photograph of the original Games Workshop Edition. Everything from the artwork on the cards of Fantasy Flight’s DungeonQuest to the board itself looks great, with very thematic designs and coloring. On top of that the cards and the tiles are of good quality which means that, as long as they are decently cared for, they will last for hundreds of playthroughs. DungeonQuest doesn’t boast many in terms of miniatures, but the adventurers are decently detailed and, again, made of good quality material. However, they are a tad soft which can lead to them warping slightly if not properly cared for. How is the Gameplay in DungeonQuest? Good artwork and components can’t save a game if the gameplay is sub-par. 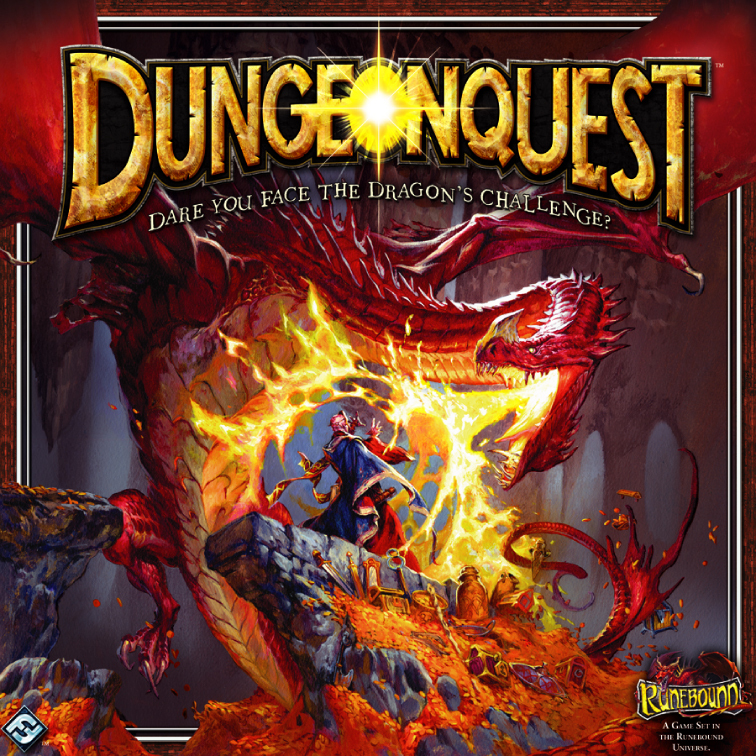 DungeonQuest is a pretty polarizing game, with the gameplay being the main area which divides those who love the game and those who despise it. As stated above, gameplay in DungeonQuest is focused on drawing cards, or tiles in the case of dungeon chambers, from the appropriate decks to see what happens and where the player will end up. Again, this does help each playthrough feel unique and is effective in running the dungeon without having a player manage it. On the other hand, the game feels like it’s on autopilot most of the time. Whether you find a bunch of treasure or a swinging pendulum is purely determined by how lucky your draw is and, in many of those cases, how much damage you take or whether you die is all based on a single dice roll. This can, and has, lead to some frustrating deaths while a buddy cruses through with his pockets full of precious jewels. One area which breaks this up is the combat against the monsters of Dragonfire Dungeon. In the original edition of DungeonQuest, combat was almost handled like a game of rock-paper-scissors, again, with random card draws determining which the monster does. In the 2010 Fantasy Flight edition, combat was completely revamped with hands of cards, counters and deathblows. While, on its own, the combat system works pretty well, it seems a bit out of place in a game that moves so quickly and can kind of bog the whole thing down. On the other hand, there is some decent strategy in the combat system and, if approached with the right mindset, battles feel suitably epic and tense. Outside of combat, DungeonQuest has a quick pace and flow to it. Games never feel too long and rarely drag (again, except for combat in a 3 or 4 player game). 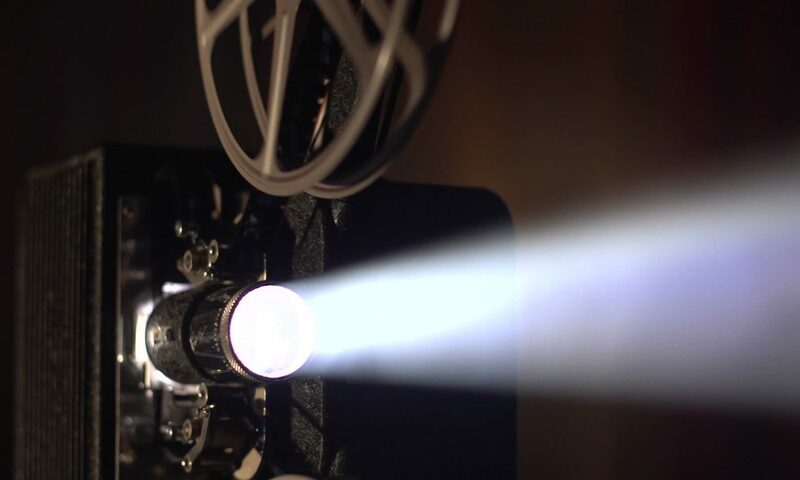 As a whole, gameplay is easy to understand and teach and only rarely suffers a hiccup. The combat system may feel out of place from time to time, even thoguh I found it to be an interesting system. However, if you don’t, Fantasy Flight has provided players with variant combat systems which fit better into the quick and simple gameplay of the rest of the game which can be found here. Is DungeonQuest a Good Game? Aside from combat DungeonQuest has a great deal of luck which, by itself, will make or break the game for most people. For me, at least, I think that the insane levels of randomness and brutality (the game will kill you most of the time) is what makes it interesting. 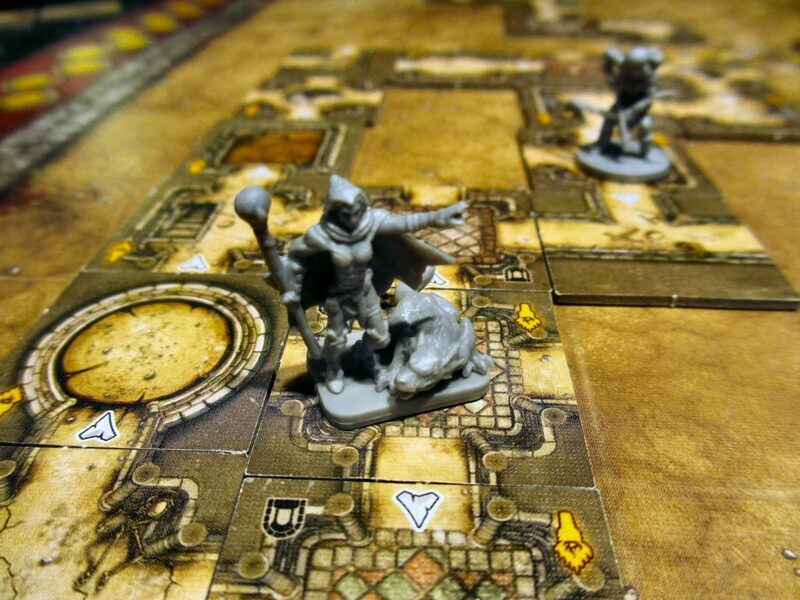 DungeonQuest is not a deep strategy game, but more of a push your luck kind of game. As you play more and more, you begin to know what the possibilities of each action are, and have to weigh whether to take the chance or not. That’s what makes the game stand out for me. Do you go into the catacombs or not? Do you keep going toward the treasure chamber, or just leave with what scraps you could find in the halls? Do you fight the troll, or try to escape. It’s moments like that that make DungeonQuest interesting. As a whole, DungeonQuest is certainly not for everyone. It can be frustrating and brutal and, many times, impossible because of some bad luck drawing cards and rolling dice. However, if played as more of a gambling or arcade style game, where players push their luck and keep high scores, it can be very enjoyable. The dungeon theme comes through pretty strongly and it’s quick and easy to teach and fast to play (90 minutes tops). Again, it’s not for everyone, but in the right group DungeonQuest is tremendous fun. Just make sure your group knows what to expect beforehand.